With barely a week until Election Day, both Hillary Clinton and Donald Trump are making their final appeals to undecided voters in swing states. In the past several days, both the Republican and Democratic nominees have reached out to LGBT voters — though they've taken markedly different approaches in doing so. 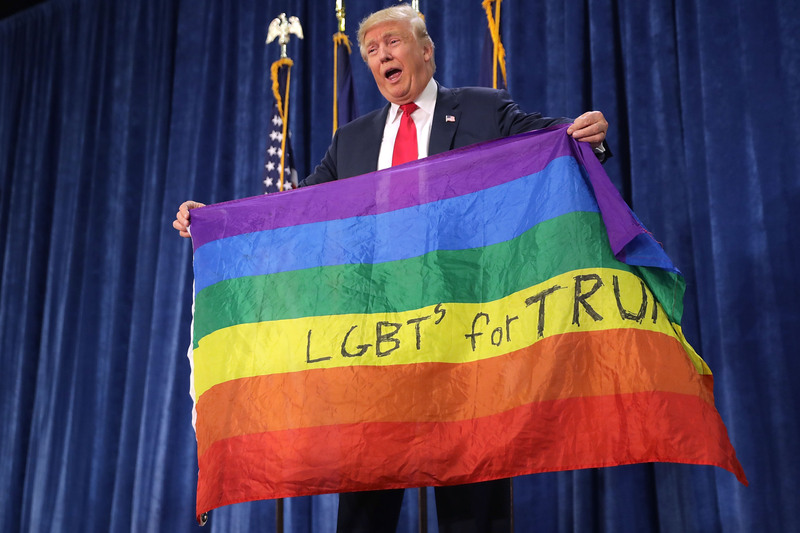 Trump took to the stage in Greeley, Colorado, on Sunday carrying a rainbow flag emblazoned with the words "LGBTs for Trump." Earlier that same day, Trump addressed supporters in Las Vegas with a rainbow flag posted alongside American flags. It's worth noting that Greeley, situated northeast of Denver and due east of Fort Collins, boasts roughly 100,000 residents, according to the latest U.S. Census. Registered Republicans outnumber registered Democrats by nearly 23,000 in its county, which also has almost as many unaffiliated voters as registered Republicans. Despite the historically Republican-leaning, rural nature of Greeley, LGBT residents have reported high rates of acceptance among their neighbors, and local support groups for LGBT people and family members have sprung up in the past year. So perhaps it's no surprise that several self-proclaimed gay Trump supporters tweeted out their own emotional reaction. This silent nod to LGBT Americans is typical of the Trump campaign's "outreach" to gay, lesbian, bisexual, transgender, and queer people. One of the only times Trump has mentioned LGBTQ people explicitly was during his acceptance speech at the Republican National Convention, when he stumbled through the acronym. During that speech, Trump also mentioned the June 12 massacre at Pulse nightclub in Orlando, where 49 people were killed when a lone gunman opened fire inside the popular gay bar. What Trump didn't mention about the Orlando massacre then (which is the deadliest mass shooting in modern American history, and the worst anti-LGBT hate crime ever committed in the U.S.) was that just hours after the shooting stopped, Trump "congratulated" himself for "being right on radical Islamic terrorism." Patton did not address the irony of using the hashtag #LoveWins, which went viral last year when the Supreme Court made marriage equality the law of the land, to support a candidate who has promised to appoint Supreme Court justices who would overturn that ruling. Even The Washington Times, a conservative newspaper based in D.C., understood that "Donald Trump has repulsed gay voters to the point where they don't want anybody associated with the GOP presidential nominee visiting the memorial outside the Pulse nightclub, the scene of the most deadly terror attack and most deadly anti-gay violence in U.S. history." LGBT activists have also been quick to point out that Trump's running mate, Indiana Gov. Mike Pence, is arguably best-known for signing the anti-LGBT Religious Freedom Restoration Act (RFRA) in his state in 2015. That law made it legal for businesses and individuals to deny service to LGBT people, so long as they cited a "sincerely held religious belief." The backlash was so strong that Pence ultimately had to amend the law — but not before his state had taken a $60 million financial hit. Pence, who has repeatedly described himself as "a Christian, a conservative, and a Republican, in that order," is also on-record supporting the discredited practice of "conversion therapy," which attempts to turn LGBT people straight and cisgender (non-trans). The unscientific practice, which uses prayer, shame, and sometimes violent aversion therapy, has been denounced as harmful by every major medical and psychiatric organization in the country. It's illegal to practice on minors in five states and the District of Columbia. By contrast, Hillary Clinton on Sunday flat-out rejected conversion therapy, in a speech aimed directly at LGBT people in Florida. "LGBT kids don't need to be cured of anything," she said. "Know we will then be able to protect LGBT Americans from discrimination in all aspects of our lives," Clinton said on-stage at the Manor Complex, an LGBT club, in Wilton Manors, Florida. "We will work together to achieve an AIDS-free generation. We will take on homelessness, bullying and violence, particularly youth homelessness, which disproportionately hurts LGBT kids. And we're going to end the harmful practice of so-called conversion therapy." "This election will determine whether we continue the progress we've made or let it be ripped away," Clinton said. "We know Trump has promised that he'll appoint Supreme Court justices who will overturn marriage equality and that he will repeal President Obama's executive actions to protect LGBT people from discrimination." Clinton's campaign has been closely aligned with LGBT advocacy groups for many years. Although Clinton has faced scrutiny for her slow "evolution" to support marriage equality, her candidacy has been endorsed by the Human Rights Campaign, Equality PAC, and several gay and lesbian current and former members of Congress. And Clinton's campaign hasn't shied away from discussing the Pulse tragedy. When Clinton visited the memorial site roughly a month after the massacre, she delivered a powerful statement acknowledging that "It is still dangerous to be LGBT in America." The mother of one of the young gay men killed inside Pulse has also endorsed Clinton, filming an ad for the Human Rights Campaign asking voters to help stop the hate that killed her son by voting for Clinton. There are no known family members of Pulse shooting victims who have publicly endorsed Trump. When Trump and his surrogates mention LGBT people, it's usually in passing, like an afterthought built on the realization that there may be an untapped voting bloc to exploit. Waving a rainbow flag at one rally doesn't change that, and neither does having the basic decency to spend a moment honoring the lives of 49 people senselessly killed. On the other hand, Clinton has a long history of standing up for LGBT people, working with and for them. Clinton's campaign manager, Robby Mook, is openly gay. Clinton has demonstrated a deep understanding of the unique health issues facing LGBT Americans, including the dangers of conversion therapy and other anti-LGBT mental health practices, and the necessity of accessible, culturally competent treatment and prevention of HIV. She's also the only candidate in this race who has made it a point to address the epidemic of violence against transgender people in this country, which has seen at least 22 trans people killed this year alone — most of them black trans women. There's a saying that actions speak louder than words, but in the case of Hillary Clinton and Donald Trump, LGBT voters should be mindful of the words and actions of both candidates.